In the previous lesson, we studied some options of the project window’s player. The buttons on the right having been covered, let’s study the other ones, from the middle to the left. - Let’s begin with these buttons : . They are the traditional buttons Play and Stop as you will find on video recorders and camcorders, etc. Depending on whether you right click or left click, the behavior of the Play and Stop buttons will be different. - Left click on Play : starts playing from the first image. - Right click on Play : starts playing from the current image. - Left click on Stop : stay on the last played image. - Right click on Stop : returns from the last current image. [Space] makes a pause during the play. If you press that key again, the play will continue where you had stopped it. Other playback options can be assigned to keyboard shortcuts. To do so, please refer to lesson 1 and open the Shortcut panel (by default [Ctrl+K]), and search for Play in the search field. In lesson 5, the Flip panel will allow you to assign other playback parameters. It's possible to play the animation in fullscreen, without any panels and menus. If the [F11] key is hit, the animation will be displayed on the full size of the screen. To exit fullscreen mode, hit another key or click in the window. Time Code can be displayed with the Show TC option in the Display options (in the WIndows > Animation) that we will study later in this lesson. - By holding left click on this button , you can move in the Timeline as you would do by clicking and dragging on the frame numbers on top or in the bottom of the Timeline. 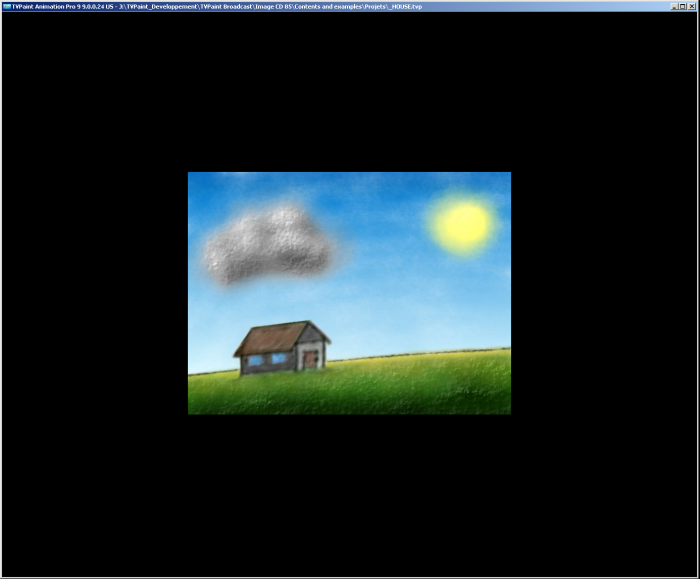 This option also works with the right click : this click will play the animation from the first to the last frame, to go back to the current image. Your project will be on top of the list. Other values will be proposed and you will be able to customize playback with a new value. It can indeed be interesting to have a speed up or slowed down playback of your animation. This function only changes the display's frame rate when playing your animation. It does not modify your project and will not be save or exported with the project. This is why the chosen value appears in red with an exclamation mark ! If you want to definitively change the frame rate, please go to Project > Modify Project. - This button (and its active form ) concerns Camera and will be studied in details in lesson 8. - This button is active by default, animation will be played on a loop. Clicking on it and animation will only be played once. - If you have chosen another soundtrack to accompagner your project (see lesson 6), this button lets you play this track when playing the project. One click on it ( ) and sound will be muted. 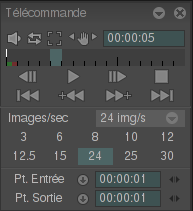 - At least, the Mark in and Mark out buttons, that we can see on the bottom right and left corners of the working space, are numeric or time values indicating the frame from which the animation will start playing as well as the frame at which it will be stopped. In order for this function to be taken into account when playing your animation, you must enable the corresponding buttons. Two red and green markers enable identification of the mark in and mark out points. You may use the arrow buttons to assign your mark in or mark out point to the current image. By right-clicking on top of the Timeline (where the frame numbers are located), four options are available with the RMB to easily set and toggle the Mark in and Mark out values. The buttons containing numbers are used to define the play frame rate (in frames per second).